So a few more Filofax web finds to keep you amused. The last day of the month, therefore your last chance in May to ask us lots and lots of questions about Filofax.... or Flex by Filofax for that matter. Say if you have 6 personals or whatever do you change them according do your mood? i,e I'm in a tan leather mood today or a red mood or a black mood etc etc? or do you buy one...use it..it gets worn..you buy another one and start using that instead but you keep hold of all your old ones? im just asking so i can use this as evidence when i try to convince the OH I need more than one because everyone else does??? Whilst everyone is getting very excited by Flex, they always say "nothing is really new". I've attached a couple of photos I've just taken of a Time Managers Planner Wallet. It's easy to see where the idea really came from! The TMI planner wallet has the four pockets (so has Flex), the notepad slot top and bottom (so has Flex) and the credit card slots are identical to Flex! The big difference is that the Time Manager Planner Wallet in the photo is 25 years old! For those who can't wait for a Flex cover in leather (which will surely come next) the Time Manager Planner Wallet is a possible stop-gap option available now, but only in the one size. I use an A5 Kendal with Filofax Time Management Pro content, but also have a Time Manager Compact binder for travel and portability. This brings the benefit of a Flex type binder (in leather) with small rings in the middle for papers that need sorting. Again, a photo is attached of mine. The binder is a lot sturdier than Flex appears to be (something that others have spotted to). The rings are 17mm and the same hole spacing as Filofax Personal. Longterm, maybe Filofax will produce a Flex with a fixed small ring that would combine the benefits of the slimline Flex AND a conventional ring organiser/ planner - preferably in A5! Flex by Filofax - Readers Questions. Firstly, thank you for all the feedback and questions on the reviews. This final part I hope will answer all of the outstanding questions. We won't be ignoring the Flex range, but at the risk of Philofaxy becoming Philoflexy... I would like to get back to the normal Filofax style of posts. I'm sure though there will be times when we might suggest the Flex as a solution to some ones needs rather than a Filofax. Having the Flex will give us a broader range of topics to talk about and discuss I'm sure in the future. RQ1. Which colour flex will go with my Crimson Malden? Yes I know there are quite a few out there now, so this should apply to quite a few folks! Don't forget the Flex is also available in Black and also available in Personal/Slimline size too. RQ2. What is the monthly calendar we briefly saw in the video? 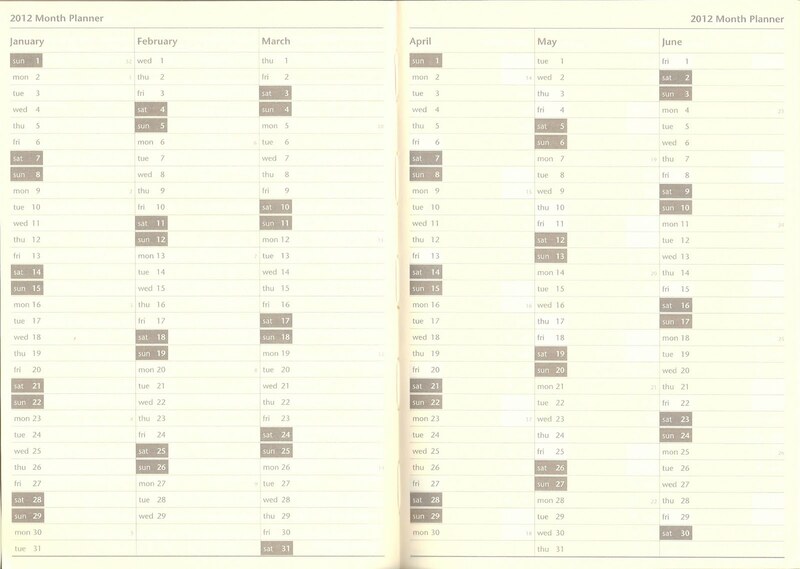 There are Monthly calendars for 2012 and 2013. 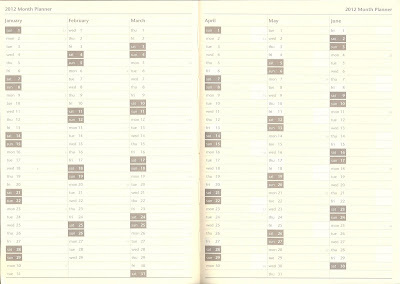 Here are the first 6 months of the 2012 calendar spread across 2 pages of the A5 Flex. RQ3. 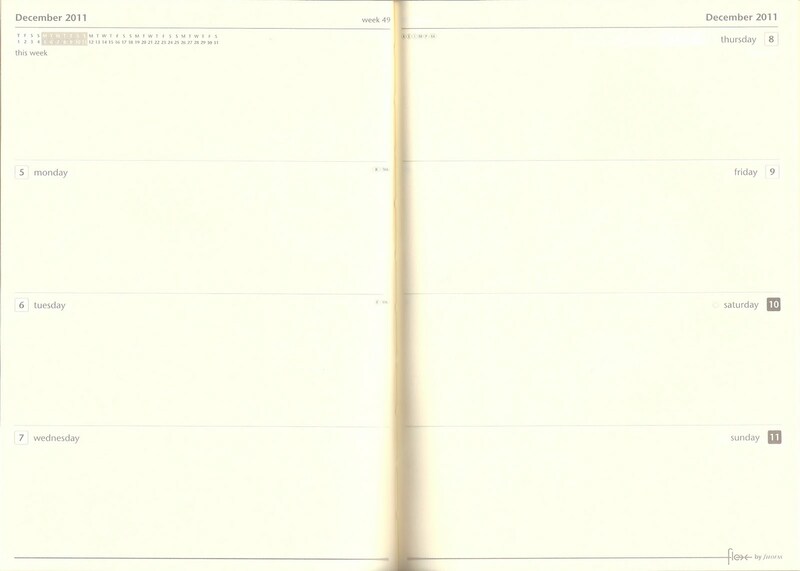 What do the diary pages look like? As you can see it's very very similar to the Week on Two Page Filofax Format that you can buy in Cotton Cream. RQ4, Do the covers of the inserts match the colours of the Flex Binders? Sadly no in the current 'First Edition' range the are all grey. And I've seen a picture of the display in Neal Street and they were all grey too. I suspect they want to keep the cost down. RQ5. What is the thickness of the A5 Flex with the thin notebook and diary? RQ6. When will it be on sale? Now.... Neal Street and Conduit Street have stock on display. It will be on-line soon as well. In the USA the release date is set on 15 June 2011. As soon as it is available on line you will be sure that Philofaxy will tell you! RQ7. How well protected are the pages in the inserts, it looked a little 'floppy' in the video. I will admit I was rushing things a bit doing the video, but if you take a bit more time and care the inserts are quite tightly held in the Flex binder. With the inserts in the inner pockets, the page edge is about 5 mm from the edge of the Flex binder. With the inserts in the outer pockets then the bound edge of the insert is more or less flush with the outer edge of the Flex binder. True it doesn't have any form of closure on the binder, or this First Edition of the binder doesn't have one. But I also use a Slimline Filofax, which is similar, there isn't a closure on that and I've never had any problems with pages getting creased or damaged. I suppose it will depend on what else you carry in your bag that is loose. RQ8. Can I make my own inserts? Making your own inserts for the Flex would be very easy to do, especially the A5. Booklet print the pages fold them in half, staple on a thin card cover of your own design and bingo insert it and you are up and running... Simples! RQ9. Is there a Today marker or ribbon on the diary? One wasn't supplied with the ones I received and the price list contained in the first part of the review doesn't mention this accessory. RQ10. If I'm buying the Flex what measure of 'Philo' do I use? RQ11. Can the Flex hold 3 notebooks? I have tried this with a plain notebook and ruled notebook along with the diary and here are the results. So on the right hand side is the diary, on the left is the plain and ruled notebooks. If we fully open the ruled notebook which is in the left inner pocket it folds out over the diary and the reveals the plain note book which is in the left outer pocket. Opening that up gives you this sort of set up. 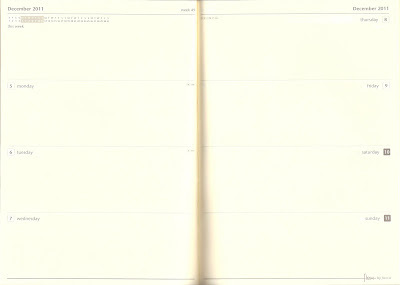 You can then close the ruled notebook, which would let you open the diary whilst still being able to see the plain notebook. And finally the whole set up closed, yes it sort of works but may be not ideal. If you have further questions ask them here or in any Free For All Tuesday. Some more great blog posts from around the web to share with you. Firstly it was not my intention to create any negative comments between readers this morning. I've taken down the original post to prevent further bad feelings. I suppose my initial anger, shock, reaction shouldn't have been shared with you all in the first place. I have a fairly short fuse at times, which I'm trying to remedy, something I inherited from my late father I suppose. Having had an hour or so away from the internet to think this thing through. I have decided that whilst it might be worth pursuing this person or persons unknown by what ever legal means are open to us, is there any point? It can't have been any accident that over 16 posts from Philofaxy where taken partly or fully and used on their own website. It was done in such a bad way as well. Comments on the posts on their site were taken from comments on other posts on our site. Photos where not used from our posts but where pinched (linked to) from Flickr or else where. So for instance my post about using my slimline as a wallet had got the pictures of the contents of a ladies handbag... now you know I use a man-bag.. but I draw the line at using make up!!!! Yes you have to see the funny side of their clumsy way of doing this I suppose. So please let this be the last on this topic. Let's get back to enjoying and discussing our real love... you are such a great bunch of people and it would truly hurt my feelings if any of you thought that you couldn't comment or enjoy the site because of some fear or bias of any type. Thank you for your offers of help and continued support. I have removed all posts you list from the site. Sorry for inconvenience. Well he hasn't quite removed all of the articles, I've sent him the link to a couple of others that he seems to have missed. But hopefully they too will be gone soon. I was extremely annoyed (substitute any offending swear words you know) this morning when I came across a site that had stolen the content from Philofaxy and a number of other Filofax related sites. The content in most cases was a direct copy it even has the formatting style of the original writers. Out of the 48 articles on this site I counted at least 16 of them taken from the Philofaxy site or my own blog. The articles had been 'revised' to include a lot of Amazon adverts and some photographs had been changed. I've sent the publisher of the site a request to remove the content, but I don't hold out much hope of it happening being that the site is registered in China. I will be in contact with the bloggers who's content I recognised on the site with the details of the site address, email me if you would like to know the address. I will not be publishing it here. As that will only give them more traffic than they deserve. The golden rule is to ask before you pinch anything on the web. To do it for your own personal gain as in this case is criminal to say the least. This weekend is Memorial Day weekend in the US, which traditionally kicks off the summer season (which ends on Labor Day in September, although the kids go back to school mid-August). If you're from Indiana like I am, this weekend is also Race Weekend as the Indianapolis 500 celebrates its 100th Anniversary on Sunday! Folks in the UK also get to enjoy a long weekend as Monday is the Spring Bank Holiday. Do you have any big plans this weekend? And as always, feel free to discuss anything Filofax-related. Join us on the first weekend in July in Rotterdam! If you plan to come, please indicate which day would be best for you: Saturday July 2 or Sunday July 3, 2011. If you are interested, please email Philofaxy philofaxy at gmail dot com and put “Edinburgh Meet Up” in the subject line. Those emails will be forwarded to Craig and he will then email the interested parties myself and create a list so that we can start discussing ideas and the timing of the day. We are going to run another conference round-table voice chat using Skype. The last one was a great success and possibly the longest we have run. When? - Sunday 5th June from 10am (US East Coast time), 3pm London time, 4 pm Paris time 9pm Jakarta etc. Times here for your city/time zone. At Laurie's request we are moving forward a couple of hours so she isn't quite so late to bed! See the clocks at the top of this post to see roughly what time you should be on line. Hope to be chatting with you on Sunday 5th June. This week's WIYF topic is pre-printed forms. Filofax has several forms available (although not as many as they used to have years ago). Finances and Day Planner pages seem to be the most widely available. There are a huge variety of forms available in the Lifestyle packs. Some of my favorites are the SOS emergency and Party Planning forms in the Family Organizer lifestyle pack, and the Travel Itinerary forms in the Travel pack. One option (that Steve is really good at) is printing off your own DIY forms and punching them to fit into your Filofax. Do you use forms in your Filofax? Do you get pre-printed Filofax ones or do you make them yourself? The A5 Malden Grey also still available in the store. Go on treat your Dad.... or yourself.... he won't mind I'm sure!! Filofax UK have a '3 for the price of 2' Sale Now On for Paper and Essentials. Click here for full details. This offer is only valid until mid-day on 31st May 2011. May be I should number these posts! They are coming though so often these days... hope you still enjoy reading the other blog posts. Well last weeks FFAT had a huge number of comments/replies. I wonder what questions you will have for us this week? Don't worry... Philofaxy isn't going to become Philoflexy...!!!! So at last I've received a replacement A5 Malden with the correct 30 mm rings. A big big thank you to Filofax customer service in UK, they were very helpful throughout this whole saga, which started soon after I bought it in London at the meet up back in March, two months ago! You can read what happened in my earlier posts. So what is the difference between 25 mm rings and 30 mm rings? As you can see above, looking at them like this the difference isn't that obvious is it? Which is which? Well the top one is the 25 mm ring one and the bottom one is fitted with the 30 mm rings. So I've already set up the smaller ring one with a 2011 Business A5 diary insert I picked up in UK for £1 this week in a shop sale in Heswall and I've moved the A5 fill from the smaller ringed Malden to the larger ring one. I will post an up date once both are fully set up. Our friends in Sydney, Australia emailed me an update on their range of covers and organisers today. Here are the details. I've stocked up on SLIPCOVERS and JOURNALS for the cocoon season - and they are on special. 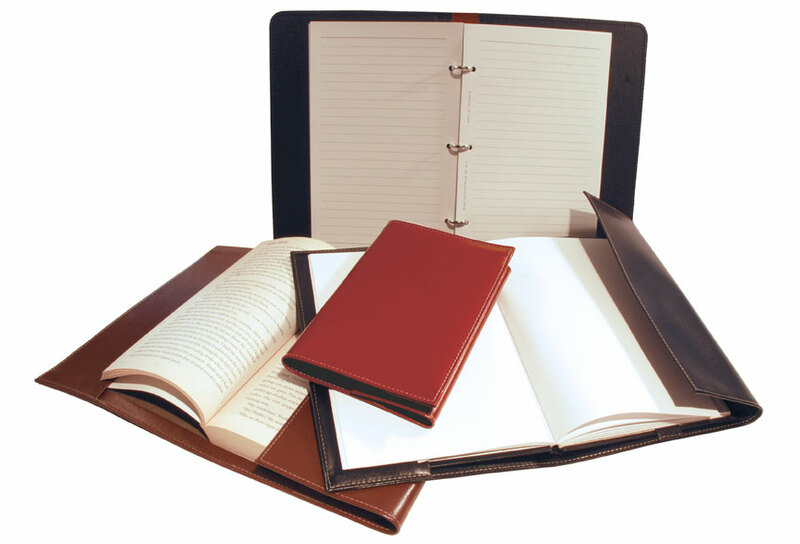 Slip covers in 3 sizes A6, A5 & A4 and an A5 3 ring loose-leaf filled journal. The slip covers are empty so you can choose your own filling (notes, sketch books, address books, diaries and even novels). If your hardbound diary (A5 or A4) is starting to look scrappy a smart leather cover will see you through this year and many more. 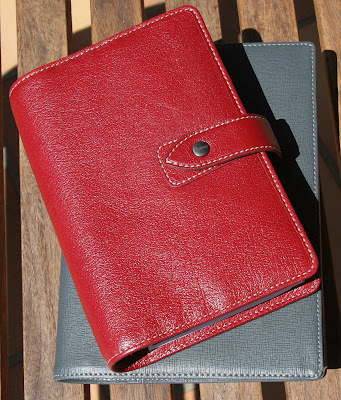 Also new in is a re-worked Brisbane style binder - the hardback of the Poco range of organisers. It's available empty or filled with 2011 diary. All in quality cowhide leather and all made in Australia. If you are in Sydney next month you can find these and other things at the annual June sale. Yes, they'll be a little cheaper as the online prices are inclusive of post. IMPORTANT: I will be out of the office until next Tuesday and I won't have email access so If you are ordering or have any questions, I won't be able to help or dispatch until next week. Sorry for any inconvenience. It's Friday once again folks, the weekend is nearly here. I'm at the end of a short visit to UK, I travel back to France tonight. Thanks for all the great feed back on the review of the Flex by Filofax, some of you have asked some questions, so I thought it best to add the answers to these to a separate post. A couple of points to clarify, although I compared the Flex to my A5 Malden, the cover of the Flex is not made from leather. It's made in some form of synthetic material, but it has the look and feel of leather....but not the smell!!! As you will have seen from the photos, the detail in the stitching is very good, very close in fact to the stitching on the Malden. But in your hands you would know it wasn't leather straight away. However, I think it is still very well made. The pockets that the inserts fit in to on the A5 (page size 14.8 x 21 cm) Flex are 21.5 cm tall, the pockets on the Pocket size (page size 8 x 12 cm) 12.5 cm tall. Weight wise with the A5 Flex fitted with the thin note book and the diary I would estimate it to be lighter than my Malden A5. With the A5 Flex fitted with the thick (256 page) note book and diary I would say it was slightly heavier than my A5 Malden. Although you will have to trust my judgement on that one, I don't have access to scales at this moment in time. I can measure them more accurately in a couple of days time. In this first picture is my A5 Malden at the top... if you need a clue... it is the one with (skinny) rings! 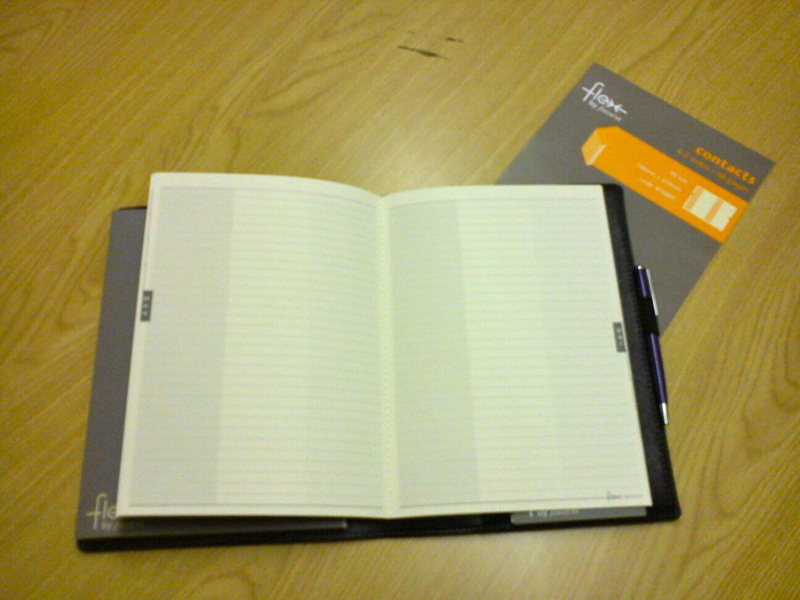 and below it is the A5 Flex, with the diary (144 pages) and the thin notebook. (80 pages) In this picture both are inserted in to the inner pockets. Both overlap each other when open. In this next picture again the same inserts in the Flex, except this time they are inserted in to the outer pockets, so when both are open they would both be fully visible (double page). As you can see it makes no difference to the thickness and the pen holder (not shown) will still fit in an inner or outer pocket, this lets you have the pen in the middle or outside (like the Malden). In this picture, I've changed the notebook for the thick (256 page) size and still with the diary insert. I had it set up as Diary in the back cover (on the right) and notebook in the front cover (on the left), but you could have it the other way around just as easily. This final picture shows the above set up laying flat, as you can see there is still a reasonable gap in the middle for the pen holder to sit in. People have asked about availability. Now available on the Filofax UK website. If you have any more questions add them in to the comments and I will do my best to answer them, although there might be a bit of a delay as I'm travelling back to France tomorrow. Although when I'm back in France I'm going to investigate doing a video review of the Flex, because I'm sure that will answer some more of your questions or confirm things slightly better. Last week before the meet up on Saturday, our 'roving reporter' Colie got to speak to some of the representatives of Filofax USA and fired some tough questions at them! Well in a friendly way of course! Last week I had the pleasure of meeting Marty Kirschenheiter, the area manager for Filofax here in NYC. Marty represents Letts of London, Lamy, Lard-O-Led, and our personal favorite Filofax. He was very excited to meet and seemed genuinely happy to hear about the Philofaxy community! After meeting with him, I have to say he is a real gem and Filofax is very lucky to have someone both responsive and enthusiastic! Marty said that he did not think the A5 Malden would be produced in red, at least not this year, but he did elaborate on the Malden line itself; noting that the Malden's leather is not bonded leather. It is instead, top grained leather which accounts for the variation we are seeing in the color and pattern of each individual Malden, especially in the Ochre color option. Marty said that the Apex line was the closest to a kids line that Filofax has produced. He seems to see it more as a teenager's Filofax, but mentioned that it is a much harder vinyl than the Metropol. "Everyone in the organization is very excited about Flex. Before I speak about Flex, it’s important to note that our new Flex product is not a Filofax. The Flex tagline is “Notes & More”, which really sums up its purpose. Flex is a brand new concept in the notebook category. Flex is a product that is used for taking notes, organizing thoughts, making lists, recording memories, sketching, planning and creating. Flex is designed for thinkers, students, romantics, artists, mom’s, dad’s multi-taskers and everyone else who enjoys (or needs) to write things down. Flex can be made to include a planner, but a planner is not its primary function. The Flex product consists of a cover, or jacket, that is cleverly designed with slots that allow you to insert special notebooks inside of it. The design and placement of the slots enables you to insert up to several notebooks at a time. The notebook inserts are formatted as ruled, blank, as an address book, a jot pad or even as a planner. There is also a way to customize Flex with multiple pen loops. The number and format of the notebooks and accessories that you use is totally up to you. Whatever you decide to put in your Flex is certain to create a unique writing experience that feels great in your hand. Look for Flex to be on store shelves in the US by mid-July." Dominic DiBella is President of Filofax, Inc. and started with the company way back in 1997, which happens to be the first year I bought my first Filofax! Dominic is a CPA and his first position at the company was as Financial Controller. Then a few years later he became CFO. Responsible for six stores, he really began to learn about the Filofax business. Sadly, none of the Filofax stores are open any more. Then in 2001, when Letts purchased Filofax, Dominic became President of Filofax, Inc.
"In my Personal Finchley I use a lot of notepaper, to do lists, and stickey notes. As for my Pocket Belgravia, I use this when I’m not travelling. My pocket sized Filofax has just has a calendar, ruled papers and many to do lists. I usually keep this in my car and take it home for the weekends." I asked Dominic which item is he particularly fond of that does not seem to get enough attention.
" I really like our Print-to-File software. 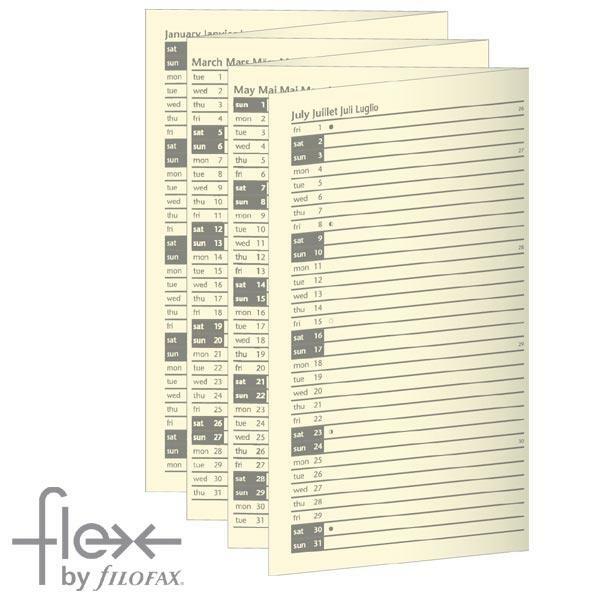 When you combine the software with our laser paper, or even with one of our hole punches, you really get a chance to maximize your Filofax...I am a big fan of our Print-to-File software and so I use it to print off all of my sales and financial reports. I then put these reports into my Filofax so that I can have them at the ready whenever I’m in a meeting. This saves a lot of space in my briefcase and really helps me to stay organized by keeping my calendar, notes and reports all in the same place." Note from Steve: I am reviewing the Flex System at the moment for you... please be patient it will be on here soon. Also I would love to know why the Print to File Software isn't available outside of the USA. ● Butaben: Any chance of an A5 Malden being produced in red? ○ "Malden is a great product and there are more colors planned for launch. Unfortunately a true Red is not presently in the works"
● Alison Reeves: Why on earth don't they have a full range of inserts on their website? there are many on Euro sites - in English - that are not available on the US site. there is a lot of interest in the refills on the Denmark site. ○ "If you are referencing the US website, we do presently carry most of the English language inserts that the company makes. Of course with the vast selection of products that we have in production there are bound to be a few that we’ve missed. If there is something that is of particular interest then please let us know and we can certainly see about adding it to our website." ○ "To my knowledge we have not produced a line that was aimed at young children. Over the years we have produced a large number of products aimed at the school market, however most have been targeted towards university aged students. We are currently working on a "youth" offering for next year. At present this line is targeted for the late teen/early twenty year old age group. The suggestions for a young student product will certainly be taken into consideration." ● Lee Ann: Will there be another sale soon? ○ "I believe this question is related to our UK website. On occasion the US website will offer discounts on items that have been discontinued from the line, but we currently do not plan to discount any of our new or existing lines." ● Lee Ann: Could they have a competition that is open to US residents? ○ "Yes there will be contests for US residents. We are working on some fun contests for the third and fourth quarter. 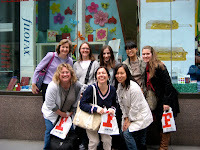 Check back with www.filofaxusa.com in the fall to see what we have." ● Lee Ann: Any chance of discounts to email subscribers? ○ "US and Canadian customers who are on our mailing lists do receive exclusive coupons for free shipping and other "gift with purchase" promotions. Anyone who purchases from our website is automatically added to our email list unless they choose to opt out. You can also add your name to our list without a purchase by going to our homepage at www.filofaxusa.com. If you scroll to the bottom you can click on the link to add your name to our list." ● Aunt Gloria: Are any plans to produce the personal in a larger ring size - any where from 1 1/4 to 2 inches? ○ At this time there are no plans for a ring size of 1 1/4 to 2 inches. We are always reviewing our ring size offerings and will take your suggestion into consideration." ● Kanalt: Any plans to sell the travel and / or city packs in U.S.? ○ "Yes, we can add these to our US website. Give us a few weeks." ● David Popley: What can you tell us about the time management professional system that is on the UK site? Any chance of it coming to the US? Is it something Filofax plans on continuing? ○ "This product has been around for many years and is quite popular in the UK. Unfortunately I am not well acquainted with this range and so I cannot pass along many details. I do know that there are no plans to bring this product into the US at this time." 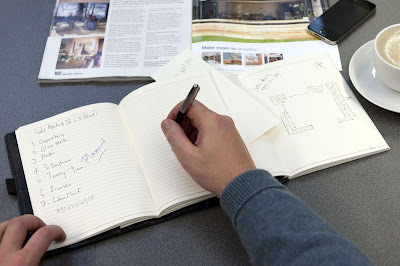 ● justenoughsalt: How are Letts, Lamy, and Filofax related? ○ "Filofax and Letts are part of the same company. Back in 2001 the owners of the Charles Letts & Company purchased Filofax Limited and then formed the Letts Filofax Group, Ltd. (LFG). The LFG is headquartered in Dalkeith, Scotland. LFG also owns the Yard-O-Led brand of writing instruments that you see on our website. As for Lamy, LFG does not own them. 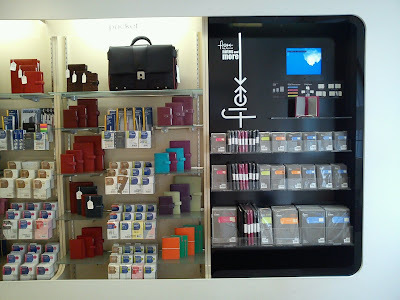 Filofax, Inc. (The American subsidiary of LFG) is the US distributor for Lamy. Filofax, Inc. are also the US distributors for Caran d'Ache fine writing instruments." ● justenoughsalt: When will the new organizers be out and in stores in N. America? ○ "Many of the new Filofax organizers will begin shipping in early June." Thank you Colie for asking all of the questions on our behalf. When a company that has been known for one type of product for 90 years comes out with a new concept or design of product, it somewhat grabs your attention. 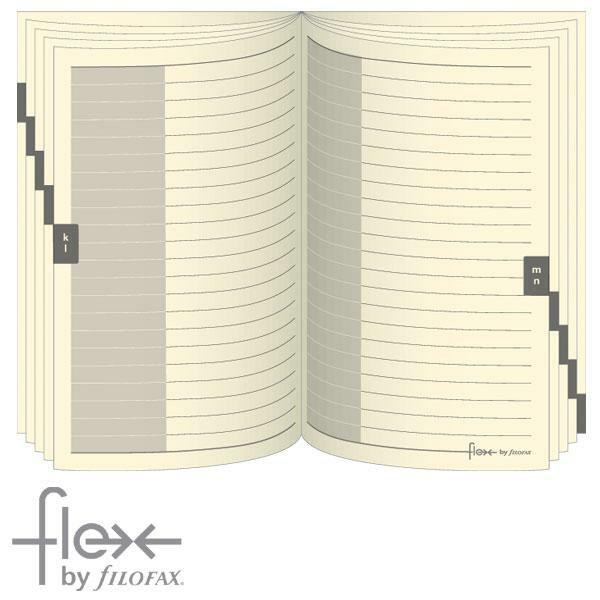 Flex by Filofax is just that. A totally new product line for them. I received a large parcel just before I left to travel to UK on Monday, it was a bundle of the new Flex by Filofax consisting of a Pocket size Flex ‘binder’ and an A5 size Flex ‘binder’ in addition I also received some other inserts for both sizes. This is the first time I had seen the Flex system, so it has taken me a few days to fully assess it before writing this review. Yes it’s made by Filofax, but it is very different to the organiser systems you are currently using. There are some similarities so let’s deal with those first. The page sizes are the same, so pocket is 81x120 mm, A5 is 148x210 mm. There is a Slim size as well which is 150mm x 85mm slightly smaller than Filofax Personal Size. Like a Filofax organiser there are a selection of ‘inserts’ that you can put in your Flex binder. However, an insert in the Flex system is effectively a bound book, not loose pages. Inserts such as plain or ruled paper come in a variety of page numbers so you have some control of how ‘thick’ or ‘thin’ your Flex is. I’m not sure why, but I was expecting a very technical solution as to how the ‘inserts’ are attached to the binder. But there isn’t one. If you think of your Filofax organiser without the ring mechanism (possibly quite a costly item these days) then on the front and back cover there are slots or pockets running from top to bottom of the cover, these are quite wide. You simply insert the cover of the insert from the left or the right into the pocket. Being such a simple solution it does facilitate quite a few permutations that you can use in setting up your Flex system. Normally we think of a book being bound in the middle when you open it. With the Flex system you can have it like that. However, you can also put the binding at the edges with the opening sides in the middle. This raises some interesting possibilities, which I will come on to later. The pen holder included with your Flex binder can be inserted on the left or the right or in the middle. Left handed people can celebrate this system I think would cope with their needs perfectly. Being able to insert any number of combination inserts in to the binder allows you to mix and match the different inserts available and the method of moving them in or out of your simple is very quick and not complicated at all. For instance with the Flex binder you get a Jot-Pad, there’s no need for this to sit in the binder all the time you could keep it in your kitchen for making shopping lists, then just as you go out shopping you pop it in to your Flex binder and it is then integrated in to your system again. There are diary inserts; so far I have only seen a Week on Two Page format and Year planners. But if they one day they produce a Page Per Day format as well. You could have say Week on Two Pages on one side of the binder and Day Per Page on the other side of the binder, when open, both would be fully visible at the same time. Each week has a ‘This Week’ space along with a monthly calendar and then equal spaces for each day. The paper is similar to Filofax cotton cream; it feels quite high quality and smooth to touch. In total it is 144 pages. The level of detail in the information is similar if not the same as in a conventional Filofax diary insert, but obviously you can’t remove pages you will not use, and they have to stay in the same order. In the above picture you can see an A5 Flex binder with a notebook inserted on the left but with the binding in the middle, whilst on the right the plain notebook is inserted with the binding on the outside edge, as you can see when open it they do overlap. In the picture below on the left is the A5 Flex binder in grey sitting next to my grey A5 Malden (I had to get a Malden in here somewhere!!) As you can see the Flex binder is slightly smaller although the paper size is the same. Here I've removed all the inserts so you can see the binder in it's basic form. Even with an insert on the left hand side it is still possible to access the car slots on the left hand side. The pockets that the inserts slip in to can be used as a secretarial pocket if there isn't an insert slotted in to it. Here is a Pocket Magenta Flex binder. Again removing the inserts shows the detail of the car slots on the left and you will notice the horizontal slots for the jotter pad top and bottom so you can use the binder with the pad on the left or the right. Here I've inserted the Week on Two Page diary insert on the right and a 256 page notebook on the left. As mentioned earlier, with it fully open the card slots are still accessible. The view from above of this quite 'chunky' set up. The pen holder is still usable. And fully closed with these to inserts in place here you are seeing the binding side, so it more or less protects the pages too. Flex is currently available in stores at the moment and available on-line in the next couple of weeks. I'm not sure I would replace my Filofax with a Flex system. But I have to say I think this new product should be a success, particularly if they expand the range of inserts available and possibly the number of colours/styles of the binders. I particularly like the way the binder has been designed, the way the pockets if not used for an insert you can use then as a pocket for storing notes, tickets etc. Thank you to Filofax for sending me the free samples to review. Filofax USA - Any Questions?